I (Andrew) lived in Baltimore for 12 years before moving to western MA around the turn of the millenium. When I was there and for another decade after I’d left there was virtually no Hot Club scene in that city. Nowadays Baltimore plays host to several Gypsy jazz ensembles, lively djams and even its own Charm City Django Jazz Festival. One of the people most responsible for making Bal’mer a hotbed of Hot Club activity is one Michael Joseph Harris. Already an accomplished guitarist, Michael began focused study of Django Reinhardt’s music and guitar style in 2012. That same year he and Sami Arefin teamed up to form the Hot Club of Baltimore. Sami’s the invisible one you hear taking the second guitar solo on this otherwise fine up-close video of the group. Front and center you have Michael Joseph and violinist Matt Andrews—that’s Shawn Simon on bass. Michael has a special mission at DiJ 2018. 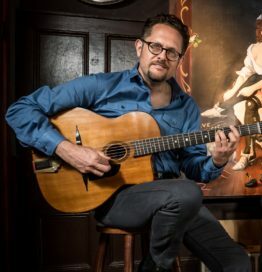 In response to requests we’ve received over the years, we’ve asked him to offer an afternoon class every day specifically tailored to the needs of guitarists who are already skilled jazz players, but who have not yet explored in-depth the things that make this guitar style unique: technique, improvisational vocabulary, etc. Michael was, after all, in just that position only 5 years ago. Got questions? Take them to MJH. Then go home and make your own town a Hot Club hot spot.